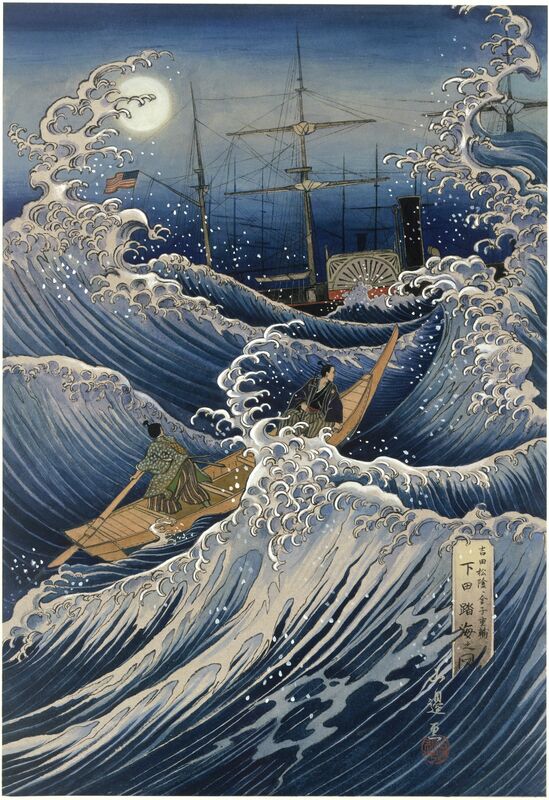 On July 8, 1853, American Commodore Matthew Perry and his "Black Ships" steamed into Tokyo Bay, forcing Japan to open trade relations for the first time in more than 200 years. The famous "Black Ships" commanded by American Commodore Matthew Perry steamed into Edo Bay (now known as Tokyo Bay) in 1853, the first Western ships to enter Japan in more than 200 years. The Black Ships were the literal "gunboats" in Perry's "gunboat diplomacy," which forced Japan to open her ports and trade with the West. On July 8, 1853, American Commodore Matthew Perry entered the waters of what is now Tokyo Bay, Japan, with four armed steamships. Perry’s show of military strength forced Japan to open its ports to trade with the West for the first time in more than 200 years. Actually, Japan was not entirely isolated before Perry steamed into Tokyo Bay. Under a policy called sakoku, trade was simply extremely limited. China, the Netherlands, Korea, the island kingdom of Ryukyu, and the Ainu people could each trade with a single Japanese port. Japan strictly forbid any trade with the U.S.
Perry and his so-called “Black Ships” are usually regarded as an example of “gunboat diplomacy”—the pursuit of foreign policy with the threat of naval power. The Japanese were not familiar with steamships and, according to some accounts, thought the Black Ships were “giant dragons puffing smoke.” The heavily armed ships intimidated the inferior Japanese military and allowed Perry to demand to meet with government officials. He brought gifts for the emperor, including a working model of a steam train, a telescope, and a telegraph. Today, Black Ship festivals in both Japan and the United States celebrate the opening of Japan to the West. body of water partially surrounded by land, usually with a wide mouth to a larger body of water. courses of action or thought that guide a nation's relationship with other nations. pursuit of foreign policy with the threat of military power. to fill with fear or dishearten. type of government with a king or queen as its leader, or the land ruled by that king or queen. having to do with a government's navy, or military ships and crew. system of communication involving devices connected through electrical wires. military branch whose mission is "to maintain, train, and equip combat ready Naval forces capable of winning wars, deterring aggression, and maintaining freedom of the seas."